If you remember a little while back, I was complaining about how I got seduced by a dumpling recipe that we ended up hating. Well, it occurred to me that if I wanted to substitute matzo balls for dumplings, it would actually be pretty easy. The most seductive thing about dumplings is that you can often steam and cook them right in the pot of soup/stew. With matzo balls, that might be a bit harder. But what if you were to cook the matzo balls in the soup liquid separately before adding the stock to the main pot? I reserved 4 or 5 cups of chicken stock and boiled up the matzo balls about 20 minutes before I wanted to serve the soup. As soon as they were finished, in they went to the main pot, along with the stock. 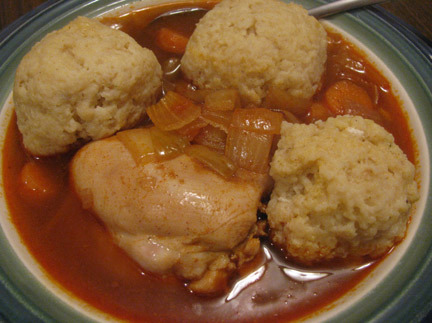 So even though the soup was a variant of Chicken Paprikash, the matzo balls will look right. I haven't shared this particular recipe for Chicken Paprikash, because I don't yet have it to my liking. Later!